The Brand New Platina II Hyperdry SP-170 Snorkel combines all the TUSA features you love with an all new design. Making this one of the most stylish and feature packed snorkels on the market! Hyperdry system with three current rectifying plates. New pre-angled purge valve to elminate gurgling of water by breathing and allowing air bubbles to pass by the face. Three-dimensional pipe curve for the ideal angle for snorkeling. The oval design has now been further improved, it provides direction to water blown upward to insure a clear snorkel at all times while minimizing water resistance while snorkeling. The pipe interior, with its bellows section, has a new flush surface to further smooth the airflow. 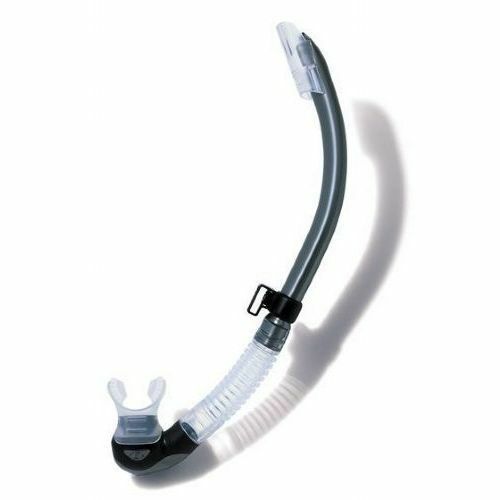 The Sp-170 features newly developed snorkel adapter that integrates a swivel mechanism to the pipe clip and strap attachment. This mechanism allows the snorkel to swivel to any position making it comfortable for all types of divers.